Released by Music Theories Recordings, the debut album includes the talents of Mike Portnoy (drums, vocals), Dave LaRue (bass), Neal Morse (keyboards, vocals), Casey McPherson (lead vocals, guitar), and Steve Morse (lead guitar). "The album has bits and pieces of what you'd expect from each of us,” says Portnoy. “The sum of all its parts led to brand new, unchartered territory for everyone involved." The formation of Flying Colors began with a simple idea: virtuoso musicians and a pop singer joining together to make new-fashioned music the old fashioned way. Refreshing, classic, old and new, the recordings are saturated with the many styles, tones and hues of the players who, in becoming a band, have delivered a unique fusion of vintage craftsmanship and contemporary music. 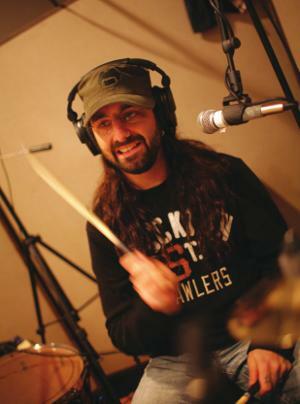 Mike Portnoy was the co-founding member and drummer for one of the world’s biggest prog metal bands “Dream Theater”. Neal Morse is the co-founding member of the prog rock band Spock’s Beard and is currently the prog rock supergroup “Transatlantic”. David LaRue plays bass for the Dixie Dregs and has also worked with Joe Satriani and Steve Vai. Steve Morse has been playing lead guitar for Deep Purple for the last 16 years. Founder and leader of “Alpha Rev”, Casey McPherson, has enjoyed major success in the US with multiple hits including the song “New Morning”. "It was quite an experience,” recalls Dave LaRue. “The band moved at a fast pace, ideas flying around the room at all times. Sections of tunes were arranged, and then re-arranged. Ideas were tried every which way until we made them work, or, in some cases, discarded them altogether. Just keeping track of everything was a challenge!" The album is filled with trial and triumph. It's been an inspiring challenge melding folk, prog, pop, and metal all into one big recording."